SAP Business One is one of the Enterprise Resource Planning (ERP) software that is primarily targetted towards small businesses. SAP Business One provides a hybrid cloud-based and on-premise solution depending on the customer or client’s business requirements. SAP Business One provides an affordable solution to businesses that give them accounting and financial management, inventory, and sales. SAP Business One is relatively straightforward to use and navigate with its flexible and modular approach. SAP Business One provides a single, integrating solution that improves visibility by delivering business intelligence and automating a number core business process. The NetSuite Competitor Analysis allows businesses to choose the right Enterprise Resource Planning Software (ERP) that will fulfill their business requirements. There are many factors to consider when implementing or migrating to an Enterprise Resource Planning (ERP) software and one of the factors is to determine if NetSuite fits your business. NetSuite is a cloud-based ERP system that is designed for Small and Medium businesses across several industries and business sectors like Retail, Manufacturing, Services, Food and Beverage and many more. NetSuite automates several business processes like financial management, revenue management, order management, supply chain, and many more business functions. NetSuite’s Scalability and pay-as-you-go pricing scheme makes it an attractive and cost-effective solution for small and medium businesses. For business who are scaling up or growing out their existing systems, NetSuite provides the perfect long-term solution for growth. 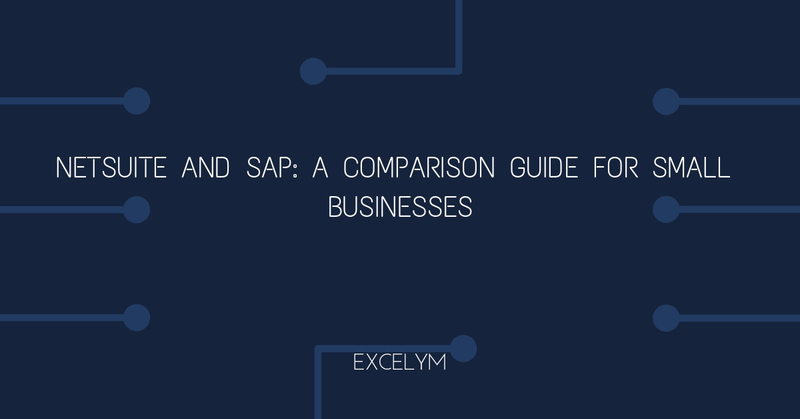 To properly compare both, we need to examine the features of both NetSuite and SAP Business One. SAP Business One has a comprehensive list of features that can help businesses increase efficiency and reduce cost. Business One streamlines and automates key business processes like accounting management. Business One also automates several tasks in accounting like maintaining checks and balances in the ledger and journal to reduce human error. SAP Business One also allows businesses to transact multicurrency transactions. SAP Business One provides small businesses with financial management that automates several business processes like Accounting, Financial Reporting, and Account Reconciliation. SAP Business One integrates business financials in real time to improve business intelligence and cash flow visibility. A. SAP Business One also has Sales and Customer Management that tracks opportunities and activities from the first contact to delivery and invoicing. Business One also has Marketing Campaign Management that helps business keep track and monitor their marketing campaigns. B. Purchasing and Inventory Control provides businesses with a systematic approach to the management and reporting of procurement transactions. C. Production Planning capabilities. SAP Business One is able to provide information regarding inbound and outbound shipments and item location. Business One has Good receipt and issue control that help businesses track stock locations, and transfers. NetSuite is designed to be an all in one cloud-based solution for small, medium and enterprise level businesses. Flexible functionalities and add-on suites that are designed for specific industries and business sectors like manufacturing, retail, and, more. NetSuite is built for global business. It is multi-language and supports multi-currency transactions. NetSuite is highly customizable and is able to integrate with several e-commerce platforms like Shopify, Magento, SalesForce, and more. NetSuite is a cloud-based Software as a Service( SaaS), meaning users can access NetSuite anytime, and in any part of the globe. It is more than just accounting software. NetSuite is an Enterprise Resource Planning (ERP) software that automates the business process to improve productivity and efficiency. The biggest advantage of NetSuite is its ability to grow with your businesses and its scalability. NetSuite allows businesses to choose between the standard two types of users or user roles. One use role has full access to the entire ERP system This user is designed for business executives, managers and supervisors. The second user role is designed for employees who do data entry roles, accountants, and inventory clerks. NetSuite Solutions Providers like Excelym can also help businesses customize user roles depending on specific business requirements. Real-time reporting and analytics. NetSuite provides businesses with a highly comprehensive and customizable reports dashboard that provides crucial information at a glance or detailed financial reports for accurate and real-time reporting. NetSuite provides businesses with a long list of benefits and advantages. NetSuite is more than just an accounting software that does payroll or checks the balance it is a comprehensive financial management software that provides complete automation of businesses processes from quote-to-order fulfillment. Here are just a few key features of NetSuite features that provide positive benefits to businesses. NetSuite has full functionalities that help improve transparency in procure-to-pay transactions. This includes requisition, purchase order and invoicing. Seamless inventory fulfillment and costing from factory-to-store. NetSuite also has detailed supply chain management capabilities. Complete fixed asset lifecycle tracking, and reporting from acquisition depreciation and asset retirement. Full-service payroll processing, including support for time tracking, incentive e compensation, and expense reimbursement. Integrated budgeting and forecasting tools to help manage financial projections for improved decision making. Period locking to prevent incorrect postings to future periods and a period close checklist of tasks to sequentially completed. Financial adjustments for intercompany transactions, foreign currency revaluation, and inventory. End-to-end visibility in account receivables and payables with integrated order-to-cash management systems. NetSuite has effective oversight and compliance protocols in place to ensure that businesses have due diligence in every transaction. NetSuite allows business to follow multiple accounting standards like GAAP, and IFRS using multi-book accounting capabilities. Pre-built tax filing and reporting tools that can be configured for local requirements per country. Audit trail visibility into detailed transaction history, reports and saved searches for improving transparency and accountability. NetSuite is a global cloud ERP software that allows business to run a multi-national enterprise through one platform that integrates Enterprise Resource Planning (ERP), Customer Relation Management (CRM), and Services Resource Planning (SRP). The Omnichannel platform enables retailers, manufacturers, and distributors throughout the supply chain to seamlessly connect and communicate improving business intelligence and minimizing human error. NetSuite’s scalability is designed for small and medium businesses in mind. The cloud-based software allows small businesses to easily implement NetSuite at a lower cost compared to on-premise systems and allows businesses to quickly and cost-effectively scale up. Still not convinced that NetSuite is for your Business? Contact our dedicated Consultants now so we can help you fully leverage NetSuite’s functionalities for your business.